The 2018 Newport Beach Christmas Boat Parade Cruise and the Holiday Lights Cruise are the premier Christmas events for Southern California! 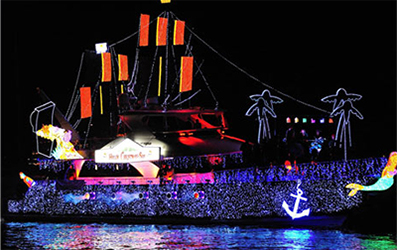 With more than 110 years of history, the Newport Beach Christmas Boat Parade Of Lights is viewed by over 1.5 million people each year. 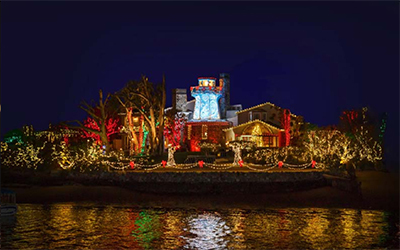 Newport Beach begins its holiday decorations after Thanksgiving, and by the first of December the harbor is richly illuminated with thousands of lights and hundreds of themed estates. 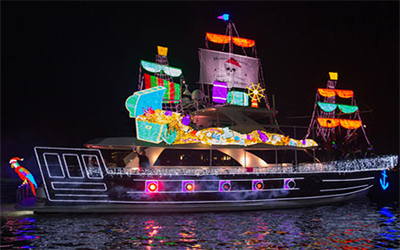 Holiday Lights Cruise - December 1-18, and December 24-31, experience Newport Harbor in full holiday décor aboard a decorated vessel on a 75 minute holiday lights cruise. 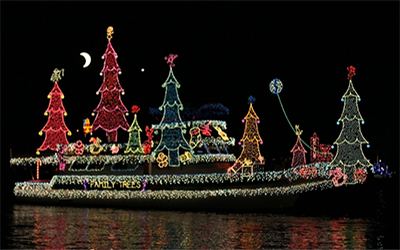 View multi million dollar estates and vessels all decked out with thousands of lights. 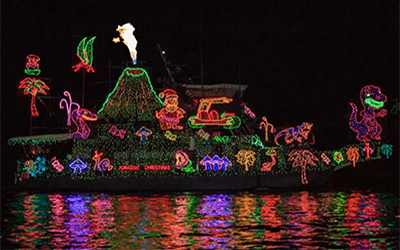 Newport Landing offers multiple cruises each night of the holiday lights cruises throughout the month of December to view the amazing light displays that have made Newport beach legendary. Adult Regular Price $36. Fun Express Price $19, save $17 each! 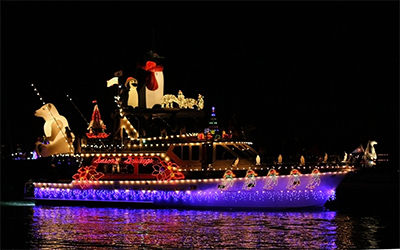 Christmas Boat Parade Cruise - December 19 thru 23, experience the 110th Annual Newport Beach Cristmas Boat Parade by being a part of the parade on a decorated boat! Three cruise times operate each of the five nights of the parade. Approximately 90 minutes. Adult Regular Price $36. Fun Express Price $19, save $17 each! Discount applies December 19 or 20 only for this cruise. This attraction is closed for 2018. For 2019 discount tickets, check back in November, 2019.